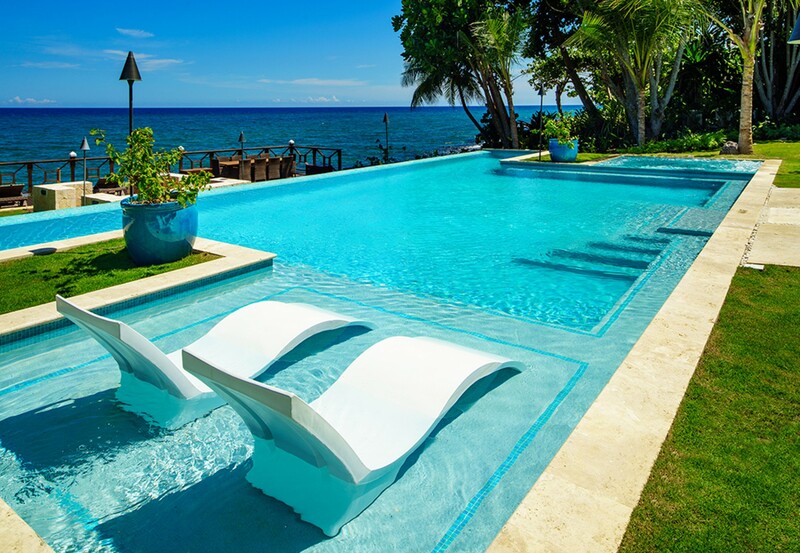 Welcome to Aqua Bay, a premier four-bedroomed villa property, within the prestigious Tryall Club in Montego Bay, Jamaica, offers unequalled views of the Caribbean Sea in a secluded setting. 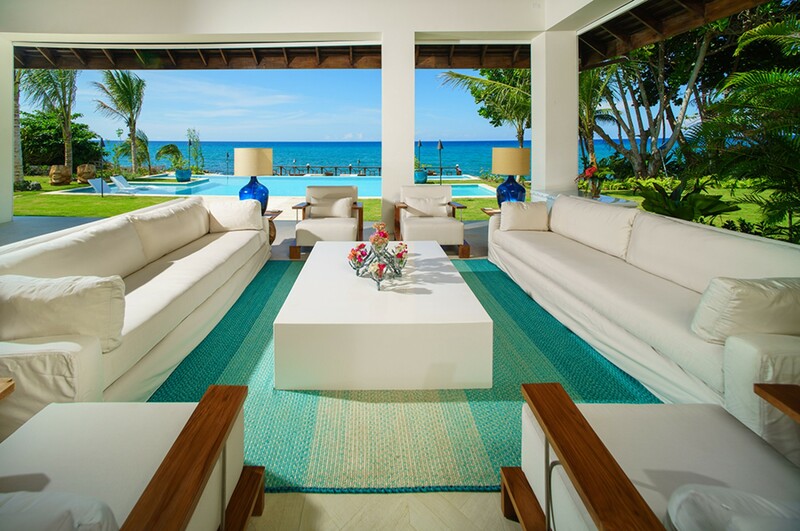 This 8,500sqft luxury villa with comfortable accommodations for 10 guests, offers a newly refurbished interior, tastefully created along contemporary lines. 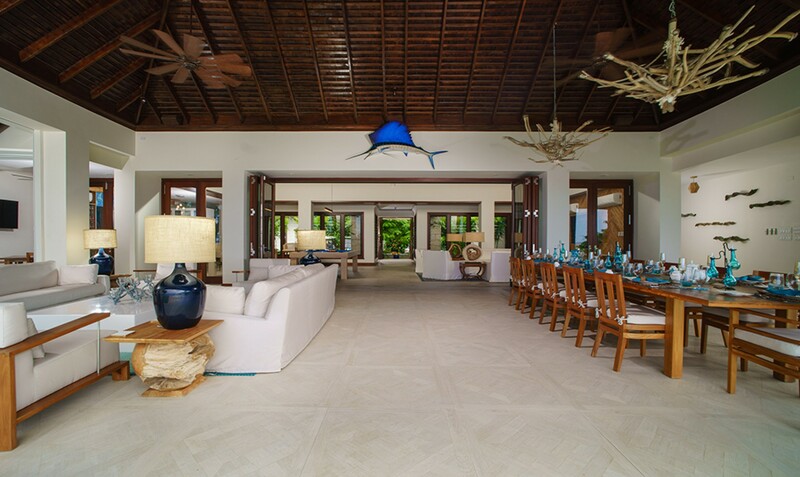 From vaulted ceilings with exposed shingles, to soft fabrics and sea-toned furnishings, the beautiful and organic qualities of Caribbean life have been captured in the interior design of this unique property. 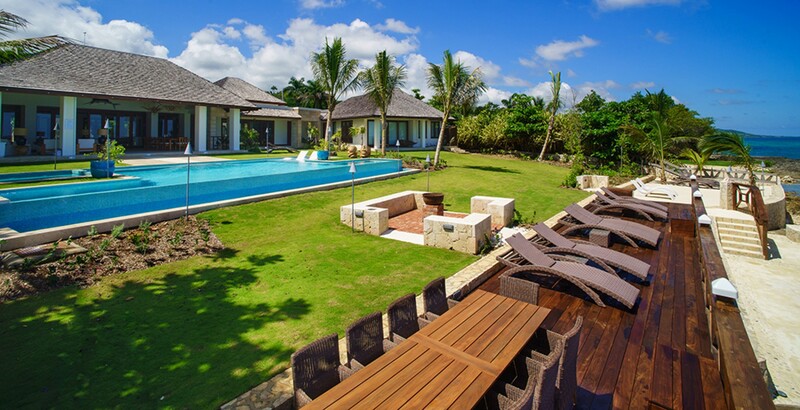 With your own heated zero-edge pool with lap lane and sun-shelf, to your second pool with sandy lido perched at the very edge of the Caribbean Sea, all wrapped inside a lush and landscaped haven, you will truly believe that you have found your luxurious castaway paradise. At only 25 minutes from the Airport, the moment you arrive Aqua Bay will delight you with the thoughtfulness of its design and layout. The uniquely structured waterfall entrance opens onto your comfortable and spacious central lounge. A relaxing seating area, a fully-realised bar, two TVs, shuffle board and full sized pool table, this airy space will be at the very heart of your evenings at home. An ideal location for parties, games or just hanging out with your family and friends. 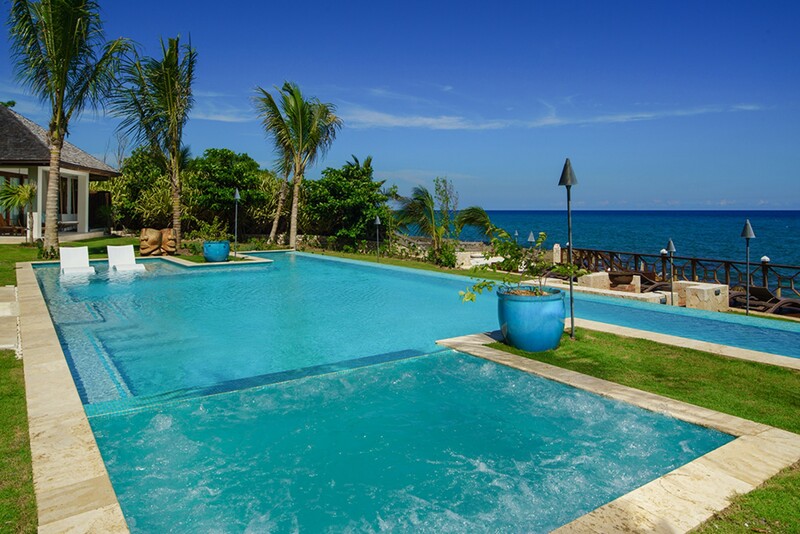 You can also venture out into the local areas and experience some of the best things to do in Jamaica. This air-conditioned space unfolds onto the covered veranda dining and relaxation area. 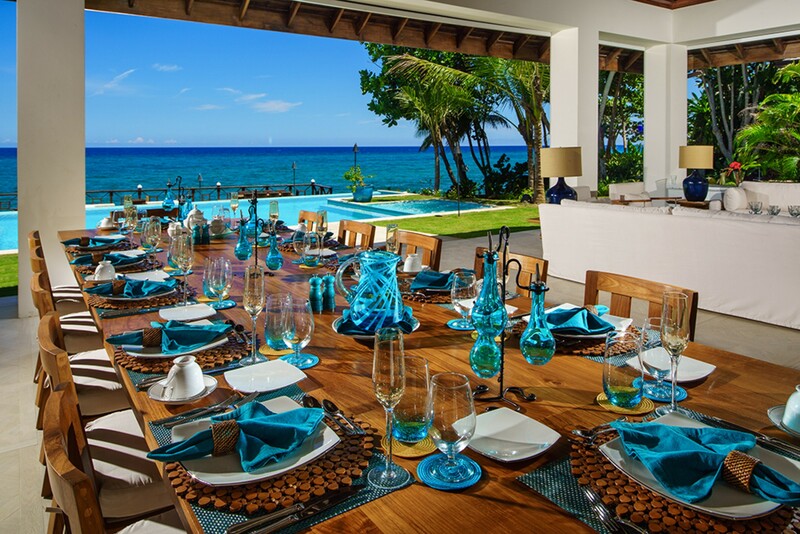 Your large dining table commands an unequalled view of the ocean. 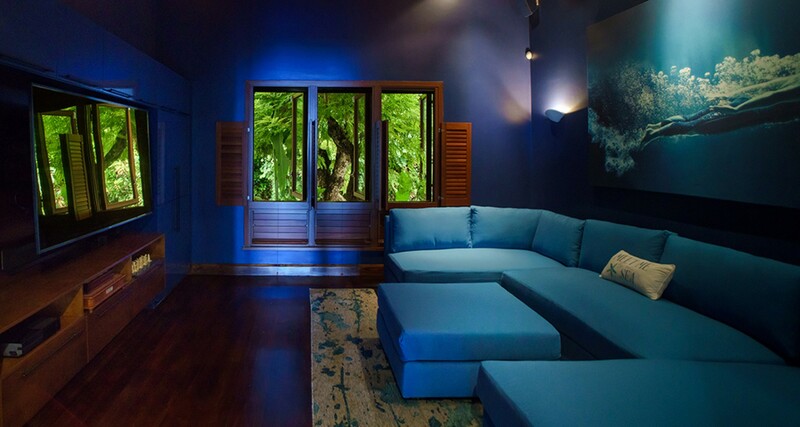 The adjacent relaxation area, under its shingled ceiling, has typically large white sofas that create that wonderful Caribbean feel to this distinct property. With a fire pit built into the area between the deck and the zero edge pool, imagine each evening sipping a cool beverage as you gaze out over the pools and gardens to the ocean …. Blissful. Your 50’ heated infinity pool and sun terrace has created a gorgeous setting from which to sunbathe while still being close to the Villa. You can also step into the hot tub that comfortably accommodates 10 or stroll along an easily-navigated path to access the sandy lido with its own mesmerising ocean-side pool. From the loungers in this setting you will feel as though you are literally floating on the ocean. 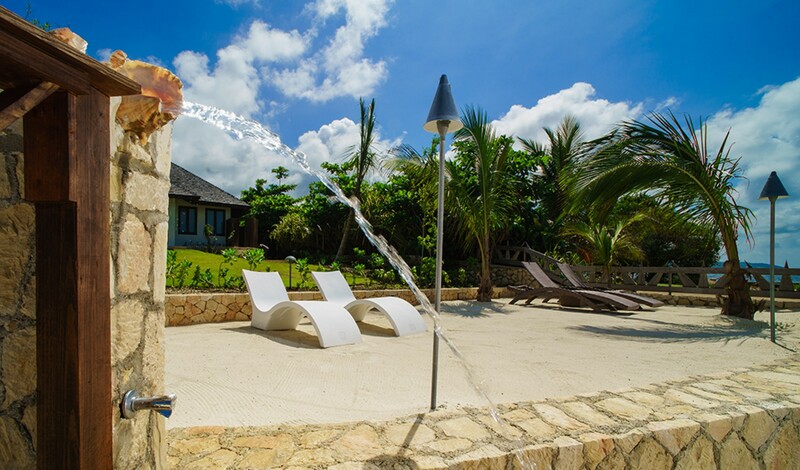 Dipping in and out of the seawater swimming holes, refreshing in the ocean-side shower or enjoying lunch in the adjacent dining area, nothing is overlooked. You will be nurtured and cared for by your staff. Each of the four beautifully appointed air-conditioned bedrooms, has en-suite facilities, its own veranda, with outside tubs. 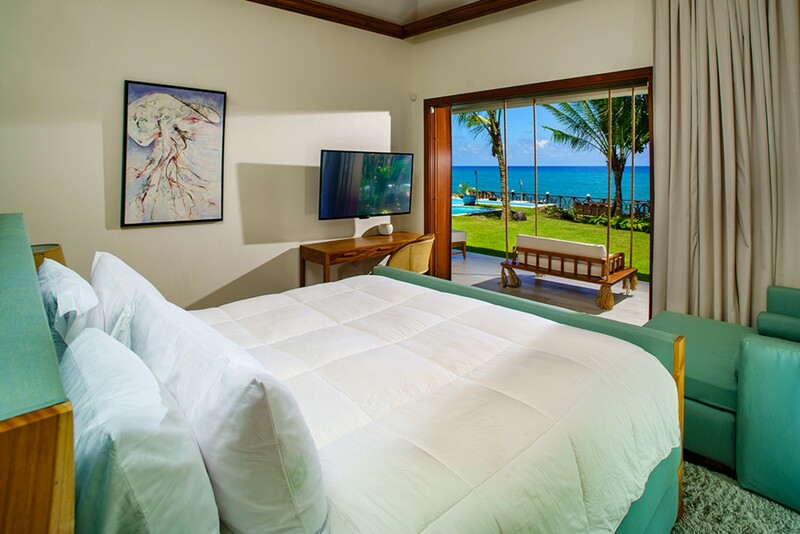 The three king-size bedrooms have a spectacular ocean view with the fourth twin queen-size bedroom looking out onto the veranda. 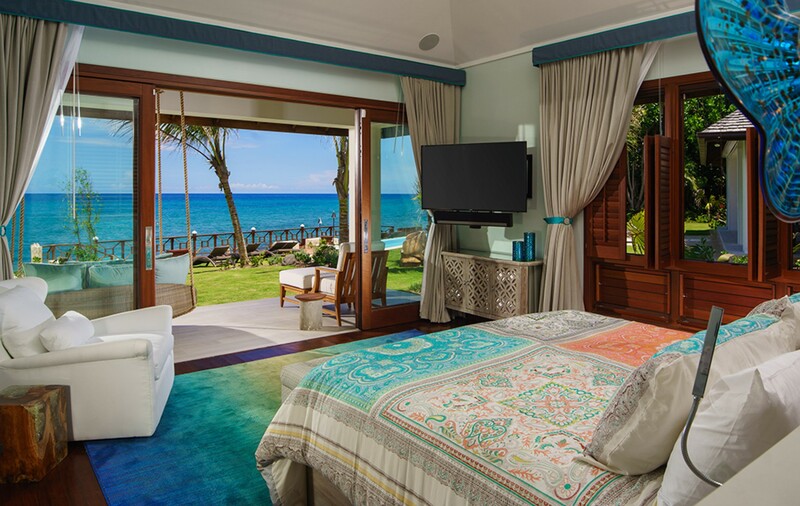 Imagine waking up each morning to the sound of the sea or having a quiet time-out as you gently sway in your double rope swinging chair in the privacy of the Master Suite terrace. 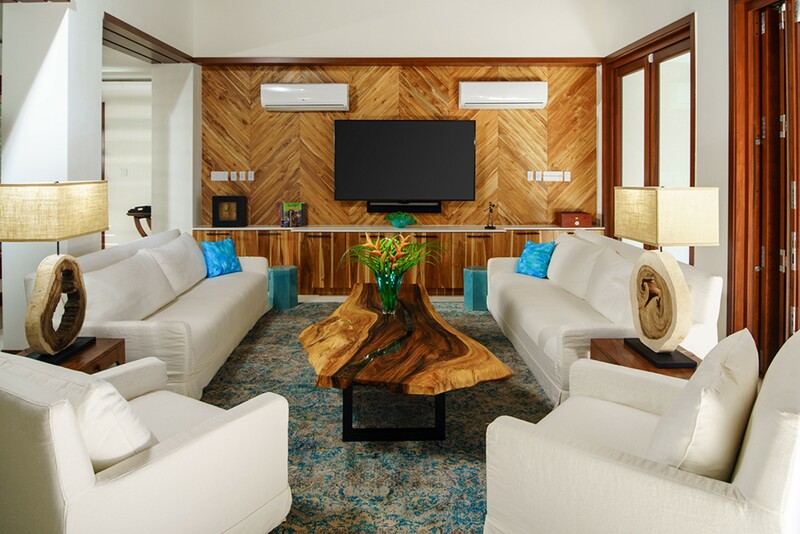 Aqua Club has its own TV room / Den with its 75” TV, surround sofas which allows guests to enjoy a movie in an air-conditioned setting. There is internet access throughout the villa together with iPad tablets, Sonos, Apple TV, Amazon Fire TV and Cable TV, everything you would expect from such a modern property. 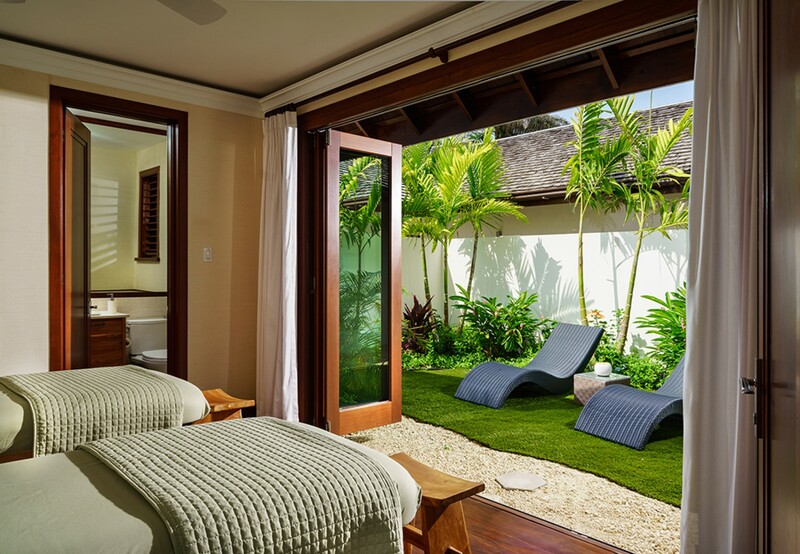 Your villa boasts an air-conditioned private gym, with its own designated massage room and adjacent secluded terrace with loungers. 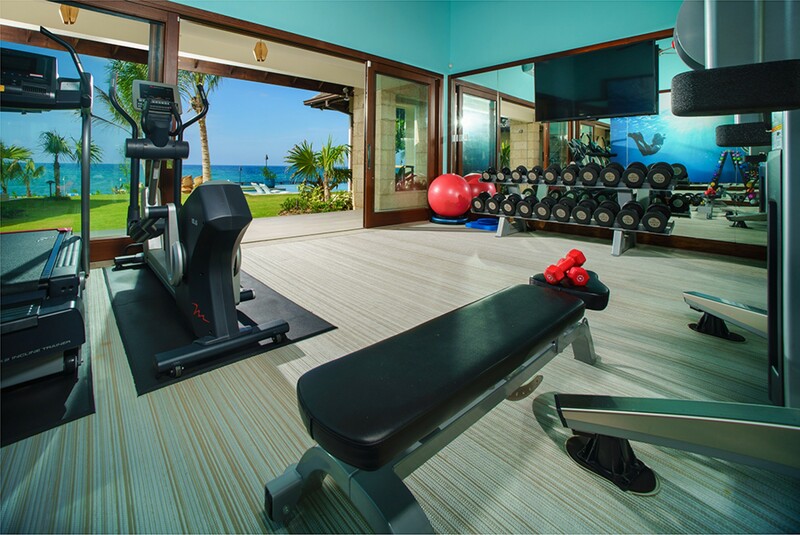 Your gym has a selection of FREEMOTION machines, free weights and PELOTON bikes as well as the usual gym accessories. 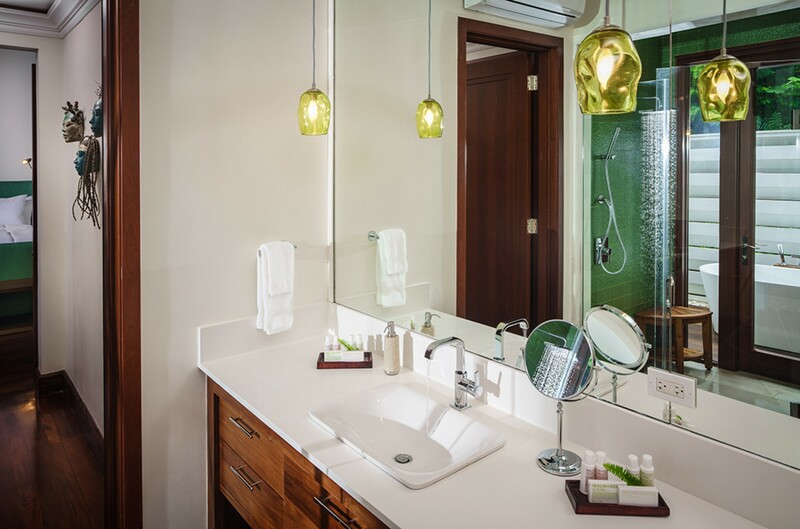 The gym bathroom allows the fitness enthusiast to refresh after a vigorous streamed exercise class. In addition, there is a well-equipped office which allows guests to efficiently manage any business obligations without being taken too far away from their party. An almost soundless air-conditioning system throughout the bedrooms and lounge and TV rooms will ensure you enjoy comfortable downtime. 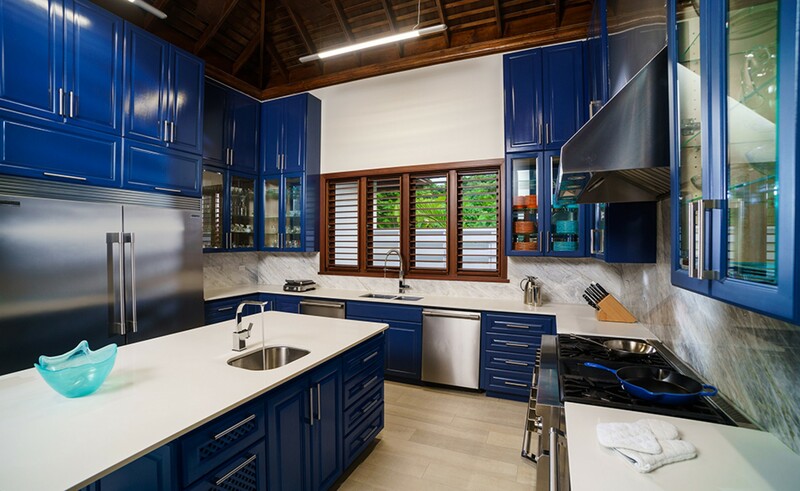 The furnishings throughout the property are chosen to create a restful palette of colours and finishes that complement an outdoor / inside Caribbean lifestyle. 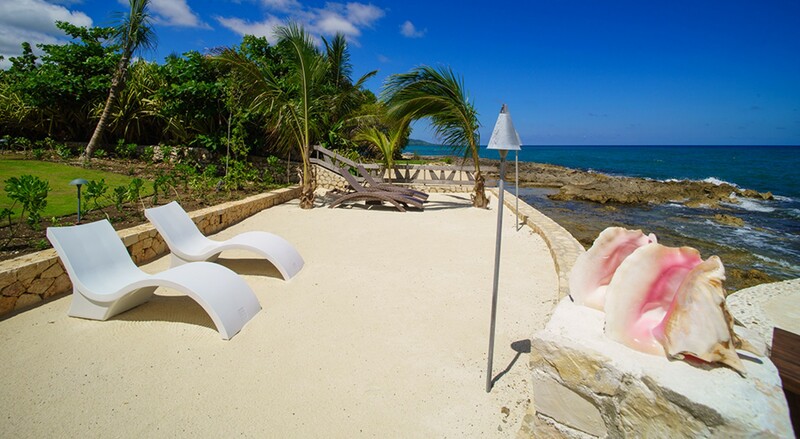 Guests of all ages will find that Aqua Bay allows everyone to keep within easy contact of one another while offering some lovely quiet spaces to achieve a meditative solitude. 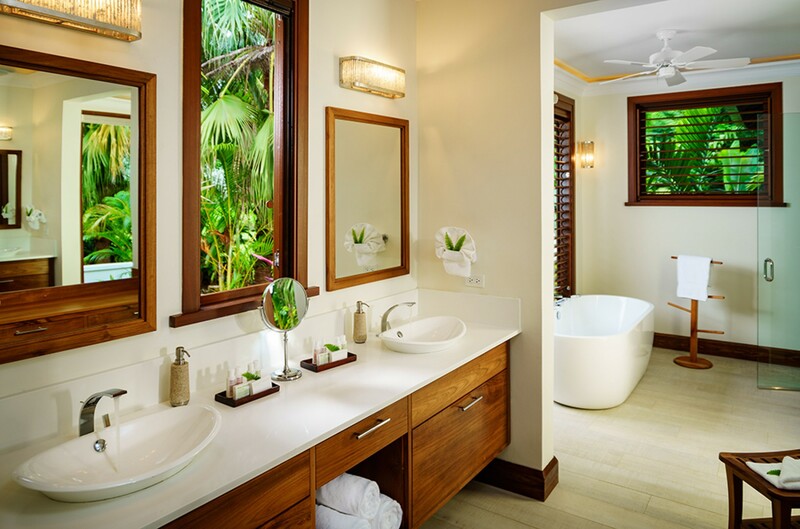 Nestled in your own manicured grounds, you will experience all the desirable elements of staying in an exclusive private villa with the added advantage of being able to take a temporary membership to the Tryall Club to avail of its vast array of amenities. Two 4-seater golf carts are permanently available at your villa making it easy for you and your guests to navigate the Tryall Club grounds and to enjoy the complimentary golf, tennis, beach, internet room, gym, non-motorised water sports available with Membership. As well, you can sign up your younger guests to the expertly managed Hummingbird Kids Club that will arrange age-appropriate activities for them each day. When you wish to step away from the seclusion of Aqua Club villa, there are a number of social activities that are organised by Tryall Club, these include sublime Afternoon Teas at the Great House, Cocktail Parties or lively Reggae evenings and BBQs on the beach. These events are a wonderful opportunity to socialise with other Club members in a fun and enjoyable setting. 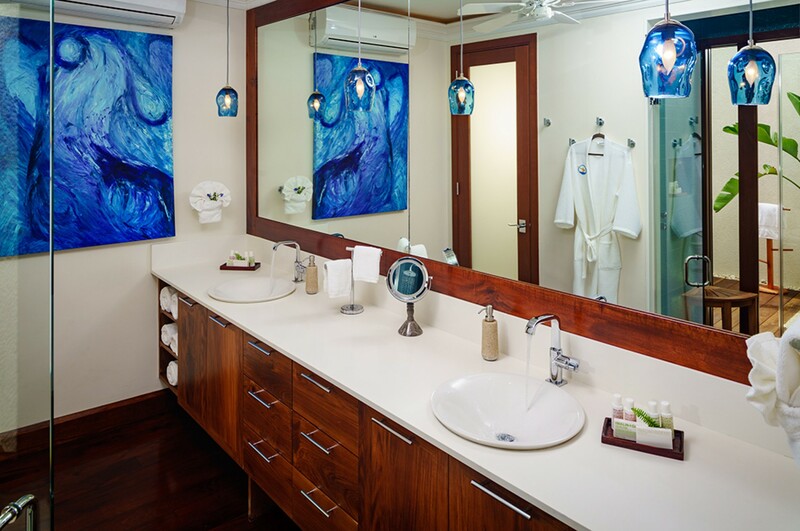 Additionally, Tryall Club boasts a Spa and Beauty Salon that will allow you to take your relaxation and sensate indulgence to another level. Your personal and discreet staff of 5, available to you throughout your stay, will arrange your holiday according to your specific requirements. Your talented chef can arrange menus to cater to healthful or indulgent tastes with your butler setting out your meals either in your tastefully appointed covered veranda or in the specially designed dining area at the ocean’s edge. 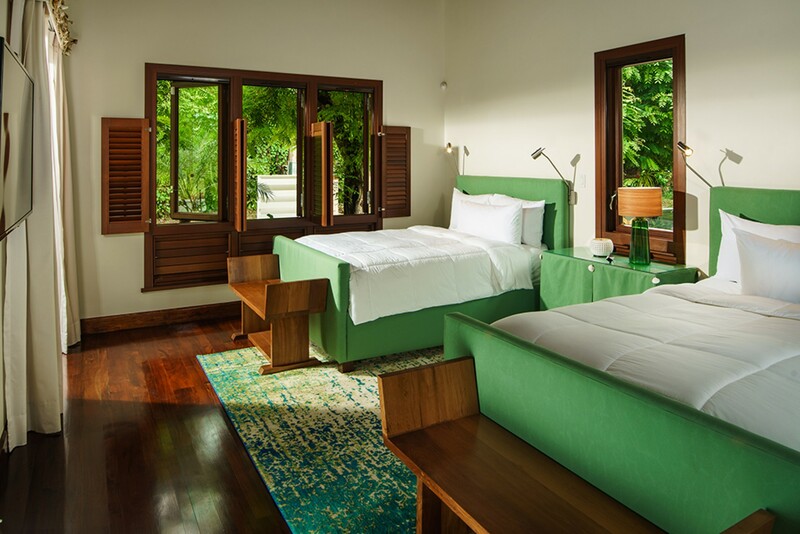 Your housekeeper, gardener and laundress will ensure your property looks and feels as serene and fresh as the first moment you stepped through the fabulous rainfall waterfall villa entrance. All the cares and duties of your normal life are suspended. Imagine the blissful sensation of breakfasting each morning to the sounds of the ocean, dining on the finest local foods, prepared and served with style, filling each moment of your stay with adventures and activities at the Club or around Jamaica. No matter how many photographs or video clips you take, you will be unable to truly capture the glorious experiences awaiting you at Aqua Bay from the tasteful and luxurious comfort of the property to the sounds and colours of the ocean, the gentle murmur of the Jamaican breezes through the trees, the explosion of tastes of local delicacies, the sensation of the warm waters lapping your feet as you steal one last swim before your candlelit supper under the stars. 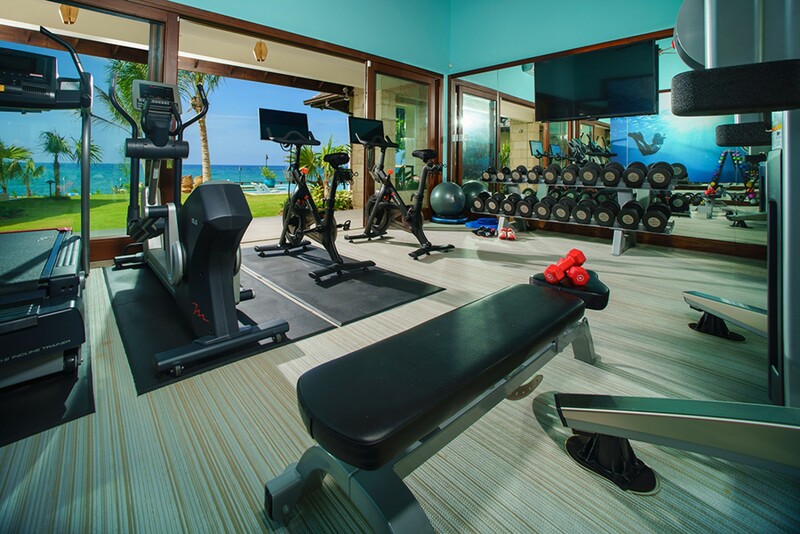 • private gym: exercise balls, 5-50lb weights, 2 PELOTON bikes – can only be used with Peloton shoes, Bench press, FREEMOTION elliptical, FREEMOTION treadmill, Kettle bells, hand weights, FREEMOTION dual cable cross. All bedrooms have quiet remote control air conditioning, ceiling fans, flat screen HD televisions and en-suite bathrooms, robes & personal safes. 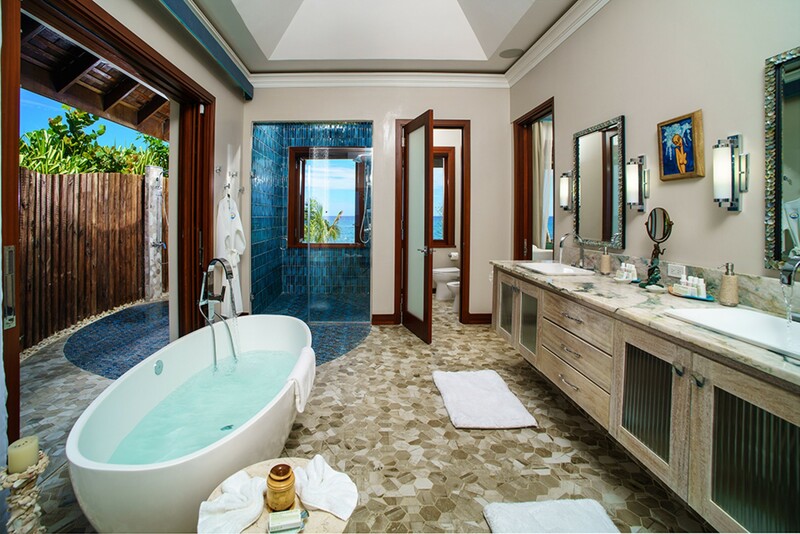 King-size bed, en-suite bathroom vanity area, walk-in shower, deep tub with double doors to garden, ocean facing veranda with swinging bench. 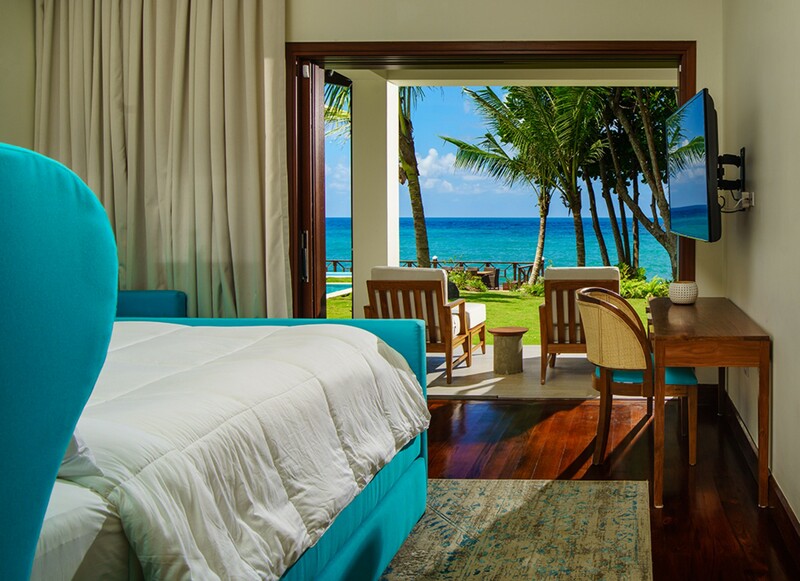 • A significant amenity for guests in this villa is membership at the excellent Tryall Club. On 2,200 acres, Tryall’s golf course is among the most beautiful in the world. Its 18 hillside and seaside fairways have been home to the Johnnie Walker, Mazda and other PGA championship events. The resident pro offers workshops and private lessons. The Tryall tennis club features 4 Agile Turf courts and 5 Nova Cushion courts, some lit for night play, with world-class professionals on call. All white attire required. • The beach is well planned for parents and children. Have lunch at the beach bar. Work out in the well-equipped gym and compete in the Usain Bolt Games Room at the Great House (teens love it). Jog the marked trails. Snorkelling, kayaking, Hobie Cat and sunfish are complimentary. Glass bottom boats, charter fishing, a boat to the reef and any captained craft attract various fees. Enjoy weekly events like the complimentary Manager’s Cocktail Party on Monday, as well as Beach BBQ and Reggae Night beach parties for an additional fee. • On the hill, enjoy the historic Great House for daily 4:00 tea and sweets. Shop at the convenient commissary and chic boutique and meet for happy hour and snacks at the casual bar. Also at the Great House is the new Usain Bolt Games Room open all day and night for ping pong, pool, air hockey, foosball, shuffleboard, chess and checkers, board games, comfy reclining chairs and HDTV. And don’t miss the massive Tryall pool. The Tryall Club is thoughtfully designed to please toddlers, preteens, tweens, moms, dads and everyone from teens to octogenarians. We loved our stay at Aqau Bay. We were a group of 7 friends and had the best vacation yet. The villa is just amazing. It is modern and there was plenty of areas to relax. We loved the pool area and the sound of the sea was just so relaxing. Tryall is a beautiful resort and we loved all of the amenities there. Can't wait to come back!